Dynabeads Tyre Balancers. The dynamic way to balance your 4x4 tyres. This section is for any vehicles equipped with large, aggressive tyres, similar to those made by BFGoodrich although the data can be applied to any manufacturer of similarly sized tyres. Make sure you check the "Ply" column when making your selection. 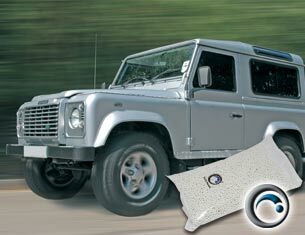 Click here for details on low profile tyre maintenance packs. If your size is not listed here, contact us and we'll supply the correct amount. The 4x4 bead is twice the size of our Standard bead and will not pass through a valve stem. Problem: Continual shaking & vibration at 65/70mph, had to drive at 60mph to avoid the problem. Result: Nigel says 'The Dyna Beads have been a big success. They have eliminated the vibration that has spoilt what otherwise is a really nice vehicle to drive and yes it is my own personal transport! I will be using & recommending the product in the future'. NB: We recommend that you use the Large 4x4 Dyna Beads for your 4x4 applications. However, should you wish to install via the valve stem you will need the standard size dynabead and an Applicator*. If yes use OFF ROAD DYNA BEADS. If you have severe wheel wobble &/or tyre imbalance, Dyna Beads are not a magical additive that will cure badly moulded tyres, rims out of true, duff track rod ends, badly adjusted wheel bearings and swivel pin preloads etc. Dyna Beads work when the tyre/rim assembly is within vehicle manufacturers design build and use parameters.